Passing Greenock on Monday afternoon, inbound for Shieldhall, was Arklow Shipping's coaster ARKLOW VENUS, fully laden with a cargo of grain from Bayonne. 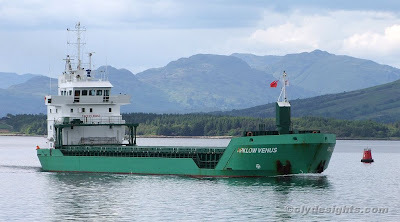 Last year, the 4.940 tonne deadweight ARKLOW VENUS made a number of visits to the Clyde with road salt from Northern Ireland. She is a little unusual in the Arklow fleet in that she was acquired second-hand.